L says she ‘bloody park running’ this weekend, if I am. We toy with doing the new one at Bestwood but in the end make the short trip to the ‘usual’ at Forest Rec. Although it’s only really been my ‘usual’ running wise, as opposed to ball chucking, for a few weeks. In the end though, L doesn’t run. She tries warming up, obviously struggles and instead supports with Doggo. MD and I run but it’s not a very quick one. So really none of use deserve breakfast in the café but we have it anyway. Then I drop L at Pilates where Daughter has already done an hour and is about to do another one. At the match, Derby actually win for a change beating Barnsley 2-1. Then, in the evening Daughter joins us at Broadway. Hidden Figures follows three black women who worked in NASA's computing section in 1961 where they performed the calculations for the space program by hand. They were basically the computers of the day as real computers were only just being rolled out to such places as NASA. Being coloured they had their own separate toilets and dining facilities. 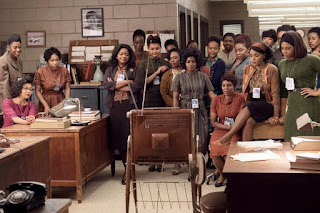 Dorothy Vaughn (Octavia Spencer) had been managing her section for some time but is repeatedly denied a supervisory position and is instead overseen by her own supervisor Vivian Mitchell (Kirsten Dunst). 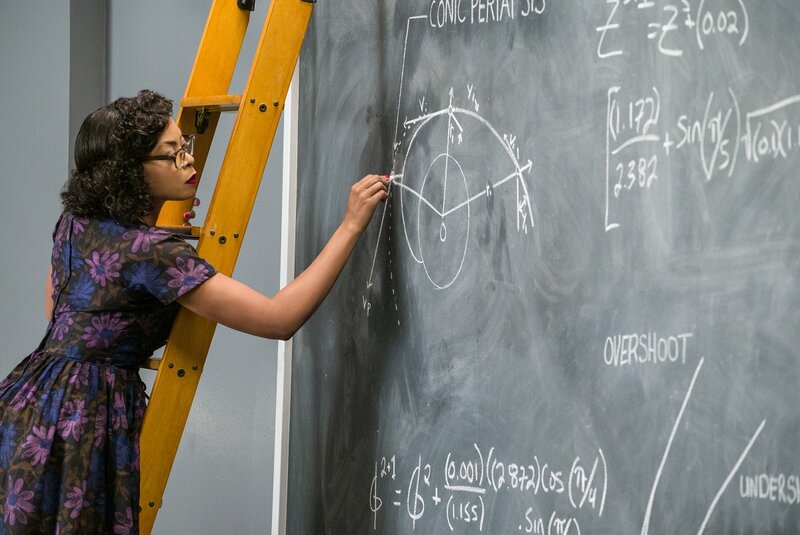 Mary Jackson (Janelle Monáe) meanwhile is an aspiring engineer but she cannot progress further because she doesn’t have the right qualifications, which she is barred from getting because of her colour. She goes to court to try to get this changed. 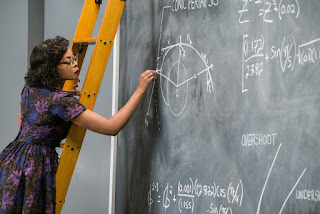 Then there is Katherine Johnson (Taraji P. Henson), who is the main focus of the film. 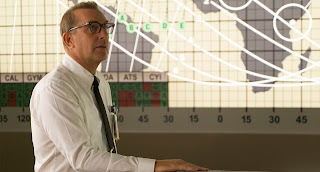 Johnson is the most talented mathematician at NASA and once they realise this she is called upon to work in the Space Task Group under Paul Stafford (Jim Parsons) and his boss Al Harrison (Kevin Costner). Their aim is to put a man in space before the Soviet Union. It’s not easy for her working in her new environment and not only because she had to climb a high ladder every day to write on a huge blackboard. She has to drink coffee from a pot labelled ‘Coloured’ and has to run half a mile back to her old building where the nearest toilet for coloured females is. While at home, she has three young daughters to raise. 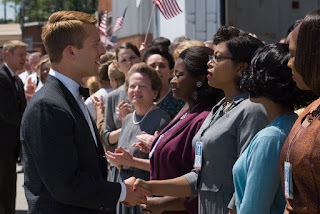 Despite all this, through her excellent work, she earns the respect of everybody on the project including astronaut John Glenn (Glen Powell). Glenn trusts her calculations above those of anyone else’s including those produced by their new IBM computer. The aim of the film is clearly to raise the struggles that the coloured minority had to be recognised at that time. 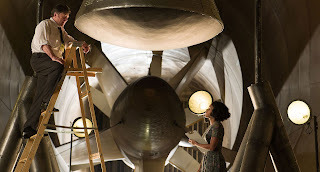 However, personally I found learning about the space race with the Soviet Union, the difficulties of getting a man into space, keeping him there and then getting him back again in one piece the most fascinating part. As it is ‘based on true events’, you of course rush home and immediately ‘google’ the plot. If only to check whether Katherine really need to run half a mile just to use the toilet? And... no, of course she didn't. That, and a whole lot of other things, were manufactured or overstated for dramatic effect. Sadly, that ruined the film for me. 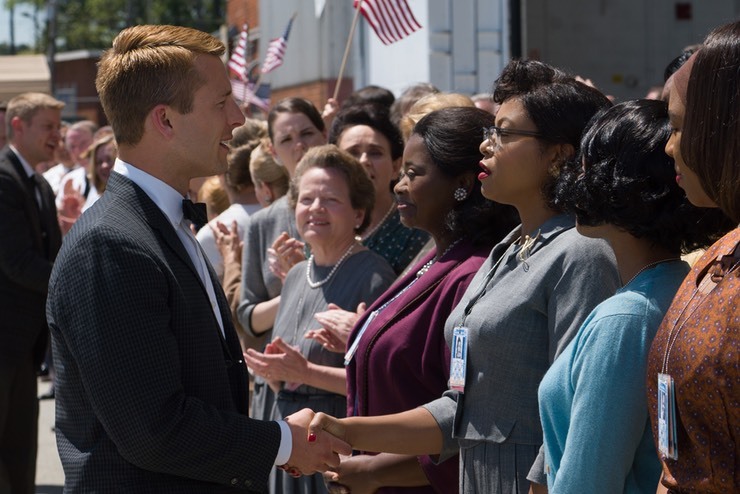 Katherine Johnson herself states that she didn’t experience any segregation and that everyone worked brilliantly together as a team. In fact, the film seems to totally undersell what Johnson achieved. As for NASA, who are practically painted as racists, they didn’t even exist until after the types of issues raised in the film were resolved. The real story is fascinating enough, so it’s really annoying that the filmmakers were not impressed by the quiet and efficient way these women actually conducted themselves and achieved so much. Therefore, it’s really just an enjoyable piece of (part) fiction that is also quite informative about the space race, which I don’t think they tampered with too much.